Here’s the fourth part of our series Being Women – the Balancing Act, where we have candid discussions focussing on the women of today, who beautifully juggle work and family. 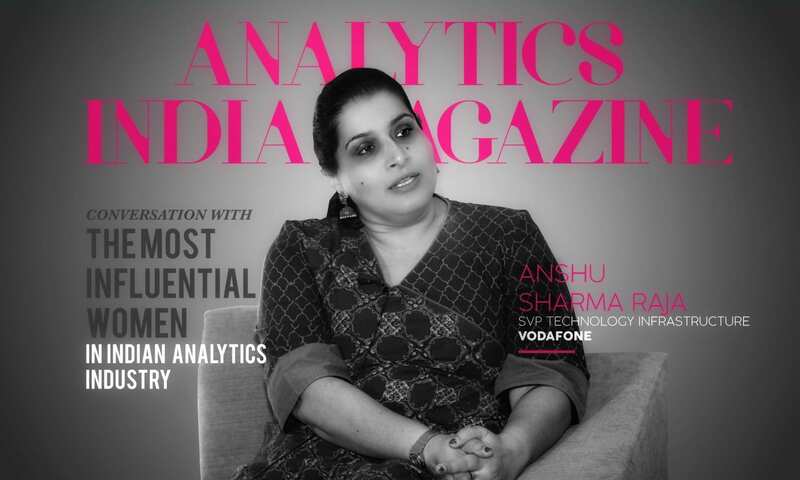 We spoke with some of the most prominent women from the Indian Analytics Industry this INTERNATIONAL WOMEN’S DAY. Anshu Sharma Raja is a Senior Vice President at Vodafone India Limited. She heads the IT infrastructure for the company in India. Prior to this she was a Senior Director and a part of the India leadership team at AIG in India. In that role, Anshu was successfully able to seed and grow the Data Science function for AIG in India. Anshu has nearly 20 years of experience, almost all of it in the financial-tech industry. She started her career programming in C++ and has since then taken on roles for leading and managing large programs and product development distributed across multiple geographies for global financial institutions. She has also worked at Goldman Sachs in Bangalore, where apart from leading large global infrastructure programs, she was also the regional lead for market data function. Anshu is passionate about guiding women returning to technical careers after a break, and mentors young women who aspire to have technical careers. She holds a Bachelor of Engineering degree in Computer Science from Bangalore University and has undergone an executive general management program at Indian Institute of Management in Bangalore. Anshu Sharma Raja: I was born and raised in a large joint family, where most of the women were teachers. So it was quite natural that I had the inclination of becoming a teacher one day. I was a curious kid but a very happy go lucky one. Knowing how things work, know about things in general around us, facts and trivia interested me a lot. Though I grew up in a large joint family, there were no inhibitions. We were raised as freethinkers and having a point of view was never discouraged. As a child I knew that I wanted to pursue something in the field of science and technology, particularly in the mathematics area. Did I have keen thoughts of becoming an engineer one day? Perhaps not. But as it turned out I followed my interest and turned to Computer Science engineering and made a career out of it! ASR: It is difficult to pick one inspiring woman, there are so many; but if I have to choose, I would say it’s my mother. She has had a great career as a much revered maths teacher, has been a doting parent, loving wife, an all rounder – somebody I always look up to. If anyone could manage work and demands of a large family, it is her. All this while remaining her individual personality, finding her me-time and following her passions. It’s from her that I got my value system of managing both work and personal life. She set a role model for me and taught me to dream big and that everything else will fall in place. ASR: Empathy, sense of purpose and challenging the status quo is what inspires me and that I constantly strive for as a leader. Leadership is not about doing it all by yourself, one cannot. It’s about creating that atmosphere where the team wants to do their best, and give their best. ASR: I cannot recall any ‘challenges’ being a being a woman in tech — but as a working woman one encounters stereotypes that are deep rooted in the environment around us at work, home and the society in general. For example, a lot of times assumptions are made on behalf of the women regarding their suitability of certain type of roles, or their ability to work odd/long hours or even travel. As a woman in the workforce I had to demonstrate that I was up for technical roles that were largely male territory, and a lot of times to ask for those roles and responsibilities. So I would say that it’s not specifically in the technology sector, but it indeed is up to women to break these stereotypes. ASR: While reactions are personal and individual, organization culture is a big influencer. Through my career while at some places there was absolutely no difference — I was instantly welcomed to the party (laughs!) at some other places, it took a while for them to accept and acknowledge my presence, skill and expertise. It takes a while to break the ice with certain set of individuals, and once they understand the competency you bring to the table, most often than not it becomes a collaborative path to achieving the organizational vision. ASR: There is a big ground to cover, honestly. It’s not only in the tech industry, but all industries in general. Tech industry employs a lot of women. Straight from the colleges and growing into senior ranks in the corporate world. Interestingly, when women are hired at campus, everybody starts at an equal pay. But somewhere the bias creeps in. There are a lot of pioneering companies that have set an example of equal pay for both men and women. But there is a lot of ground to cover. ASR: Motherhood is a non trivial event in a woman’s life – with physical and emotional changes. Coupled with the fact that there is a great sense of insecurity with respect to the work and workplace – about the role, about the position, and a lot of times self-doubt, if they’d be able to manage work and expectations of a new mother. It gets compounded by the fact that perhaps the manager, co-workers and sometimes folks at home may have similar doubts too! The best way to deal with it is to speak openly and ask – ask for the role, ask for settling down time, similarly at home front too, ask for support and setup your ecosystem – this way the transition back will be easier. ASR: That’s a tricky one! The society around us expects women to be super women – it reminds me of a cover page of a magazine that I had seen which had the woman of today as a goddess with multiple arms stretched out holding gadgets, kitchen tools and what not. So the society perhaps expects the women to have a squeaky clean home, kitchen full of freshly cooked food, to be a caring homemaker and at the same time bring home a fat salary as well! It really doesn’t matter what the society wants of you. I strongly believe that one has be clear about what they want for themselves. Once you define that for yourself and align it with whoever your inner circle is (partner, spouse, parents, in-laws, kids), everything else is then inconsequential. That’s how you garner support and motivation to keep at it. ASR: The whole work-life balance has been an eternal debate – and by virtue of physics anything you try to balance will rest on natural tension – so very early in my career I threw this notion out of the window, and have strived to create a harmonious work-life integration and minimize the tension. Between global roles, the world becoming flatter and modern day technology, there is no clear demarcation of work anymore. The trick is to plan and prioritize sometimes daily and sometimes hourly too. It’s not a formula, but a practice of time management, planning, and the ability to quickly context switch, creating a support ecosystem around you and leveraging available technology to the hilt. ASR: I don’t think I have ever encountered a barrier, yes there were challenges but not a barrier. Even as a little girl growing up, there was never a doubt in my mind that I may not work, or be financially independent. There were life altering changes, like moving cities, getting married, the birth of my two children but they were never barriers. In my current role I am a weekend mother and wife. I work out of a different city and commute back to Bangalore over the weekend, but I never saw it as a barrier. It took some getting used to, but my family, and the support at home makes it easier than it sounds. Career to me is a marathon and there will be bumps on the way, its how one views it that makes all the difference. ASR: I am fortunate to be in India where one can build a network of support system. But my biggest support system is my family – my husband who has gracefully taken over the role of both parents from Monday to Friday, my two boys who cheer for their mum, my parents and in-laws for their unwavering faith in me and a good fortune of having trusted friends. I must also mention Lalitha, who is more than a nanny to my children and who has spent nearly 10 years with us caring for the family. For me to be able to give my full attention at work creating a trusted system was not just important but essential. ASR: A lot of times the fundamental thing lacking is intent. I think corporates really need to ask themselves why they are focusing on gender diversity. Is it just a metric they want to report on, or do they really want to see their workplace, meeting rooms and more importantly board rooms at a 50-50 male and female ratio? It may not be enough to attract diverse talent to join the organization, the organization will also need to work nurturing the talent towards success. AIM: Saree or Suit ? What empowers you more in the boardroom? ASR: Power dressing for me is not about a saree or a suit. It is the confidence and expertise that one brings to the meeting which empowers you in the boardroom. ASR: My advice would be first to not confuse a job with a career – so get clarity of thought within oneself if one wants a job or a career. If it’s a career that one is seeking then you would need to enable yourself to be a success and make sure your work is as important as other elements of your life. Enabling your support system, creating a career plan for yourself, investing time in building work relationships with colleagues, mentors and sponsors constantly learning, staying technical will then become a way of life. ASR: Stats show that while at entry level it’s a 50:50 class that joins the workforce but over 10 years the percentage of women in the workplace drops down significantly. While Corporates are putting their energies behind hiring more women, what can certainly help to retain more women and see them grow is to internalize the culture of inclusion – for example masking names while shortlisting resumes seem to help eliminate bias at this very preliminary stage. Ensuring that for every promotion potential women candidates are also stacked up and to enable them to succeed. A lot of organizations have also invested in people centric policies be it for flexible working hours or having a child care centre, or a holistic performance review system. These little things act as enablers for both men and definitely women to bring their best at work.